FC Emmen is still in the race for a spot at the play offs for the Eredivisie, but they are 1 point behind FC Oss so they need a win. And if you are looking at the head to head you can see that FC Emmen won with 1-8 by Fortuna. 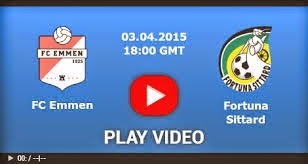 FC Emmen will win this, with at least 2 goals differance, but i want to make it a sure bet with 1,25 odd. Emmen is a team who scores a lot and Fortuna just have only 22 goals dit season so dont think they even score Friday night in Emmen.